It´s hard not to notice, whichever direction you approach Castillo de Locubin, that olive trees have been overtaken by cherry trees all around you. Locals come from far and wide to buy cherries here and cherries are also taken from door to door to be sold. I have cherries in the fruit bowl and bags of them in the fridge and I dídn´t buy any, delighted neighbours hand them out and I smile (gratefully) hoping the kids aren´t fed up of them yet. When a car tooted outside my house and a Spanish guy wanted to sell me two box fulls out of his laden boot, I laughed and aplogised. There are only so many cherries one can eat! 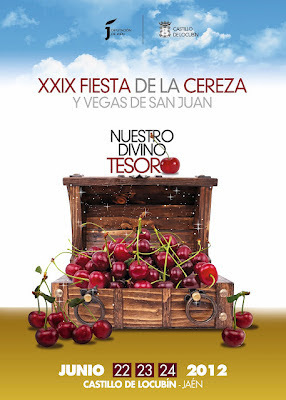 Every year The Cherry Fiesta marks the local harvest with competitions, recipes, liquros and tastings all revolving around cherries.